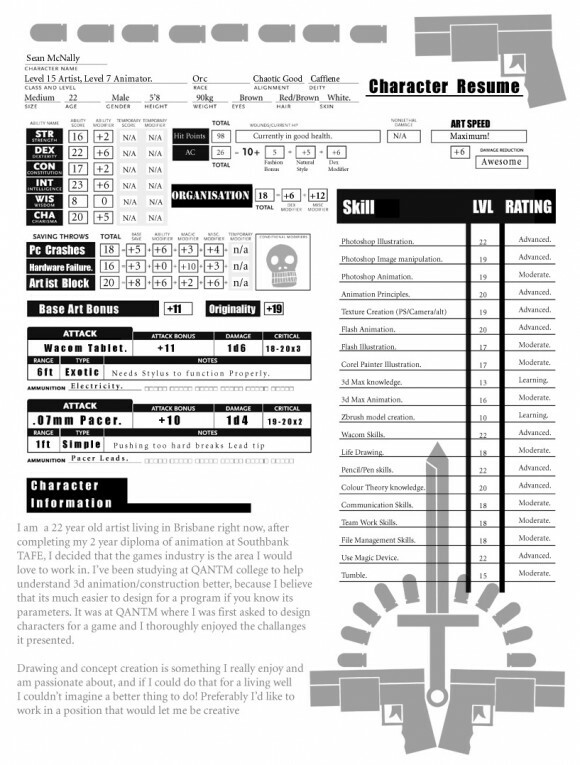 This is a Character Sheet style Resume by Sean McNally. He’s a pretty good artist actually. You can find page 2 here. I’m not sure what role-play system it’s based on, if it’s D&D then it’s a different system to the one I play. Before the man even rose to his feet the interviewer could pin-point him with ease. He had piggy-eyes, sagging skin and large tusks protruding from his lower jaw. In one hand he was holding a wacom tablet as if it were a shield, its cable trailing uselessly, and in the other he weilded a .07mm Pacer, its thin tower of lead doing a good impersonation of a filthy hyperdermic. The interviewer took a step backwards as he lumbered towards her. The applicant smiled a ghastly smile and complied. The interviewer followed behind, wondering if her eyes decieved her or if the quite ordinary-looking jeans and T-shirt were glowing faintly. Once they were seated at her desk she felt more confident. “You’re claiming it’s the result of… Caffiene? He grinned, lowering his comliness considerably. “Caffiene,” he said. At that moment a the door burst open and a pale-faced young man with his suit-jacket torn half off stumbled through allowing some of the clamour going on outside to follow after. And he left, shutting the door behind him. The interviewer and the office boy waited nervously inside, as groans and crys reached their ears. Then all was silence. The door opened. “Oh thank God!” The interviewer sighed with relief as Sean walked in. He was staring at his Pacer and shaking his head woefully. “No problem! No problem!” said the interviewer jovially, “The cleaners will take care of that!” She nodded to the office boy who scurried away. The Orc smiled. He didn’t have twenty charisma but he might as well have done.